Conceptual Innovations engineering, consulting, and custom manufacturing service focuses on delivering cost effective, technical solutions. 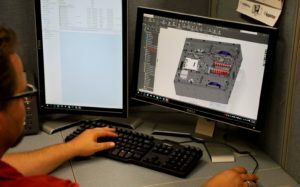 Specializing in development, testing, automation and design, Conceptual Innovations (CI) provides cutting edge expertise to companies of any size. Led by Dr. Elmer Lee, the CI team has experience in a wide variety of disciplines and can quickly assess and present actionable options for your project. Working closely with clients CI can prototype a design, create a proof for evaluation, and test for both long-term usability and endurance. Each solution is optimized for both functionality and manufacturing costs. Conceptual Innovations is second to none in industrial design and custom manufacturing. Over the past decade, our engineering department has developed into one of the most highly sought after services in the industry. With access to tools including SolidWorks CAD design platform, Finite Element Analysis (FEA) and design, to prototype dynamic testing, to laser cutting, to CNC forming, to varying durometers of polyurethane wheels, to varying chemical makeup of polyurethane wheels to robotic welding, to ISO supported manufacturing processes, Conceptual Innovations can take concepts and turn them into innovations.